Mantel Party - Jill Ruth & Co. I'm linking up today with another blog party, (I think it's kind of fun to follow a theme!) Today, it's at the Nesting Place where her motto is: "It doesn't have to be perfect to be beautiful." When I saw that, I knew I'd want to check out her blog further! Today, people are posting pictures of their mantles. I feel very blessed to have two mantles to decorate but you'll only see one today. Because, well the other isn't too "spiffy" at the moment, and it's dark in that room while my 10 y/o is sleeping in there suffering again from sinusitis. Decorating a mantel is one of the biggest decorating challenges in my opinion. Ours if far more traditional than many, but that's our house too. I would love to "change it out" with the seasons, but....just doesn't happen much. I also really just use what I have or come across at sales. I know if I went out to buy something new for the mantel, I just wouldn't like it. Our ceiling isn't vaulted; the the wood beams in the photo kind of make it look that way. The area around the fireplace, though is open to the library on the second floor. My brother (thankfully) thought to add an outlet to this mantle so we could put up Christmas lights. (My brother and his wife built our house) Now, at night, we light it up with my vintage mismatched lamps I bought at garage sales. I don't think there is anything much more beautiful than old books, so they are all over our house including the mantels. Now, if you'd like to see some creative mantels and interesting decor, head over to The Nesting Place! I'm green with envy that you have a mantle - and SUCH a gorgeous one!!! Jill - you did a fantastic job - I love the clocks!!! And how neat that your brother built it!!! I had to stop by and say hello to another Jill. I actually have a friend named Jill whose mother is named Ruth. :-) Love your mantel clock! I, too, have a collection of antique books. There's something so charming about them. 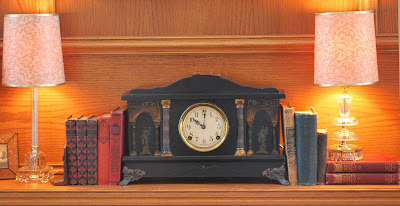 Jill check it out, we have very similar clocks and paired up with old books, I linked up to the mantel party too. We bought our clock of of ebay a couple of years ago, it is an old sessions clock....that is too funny!~ Your mantel looks awesome of course it does because I love this style! Love the mantel Jill! Always wished I had one but the top of my TV cabinet is hard enough to decorate! Just can't find the right thing yet! It is just too tall!